The Old Wenger Rangers was introduced in 1990/91 and the New Rangers in 2007 and up. The Mike Horn was first introduced in 2009. 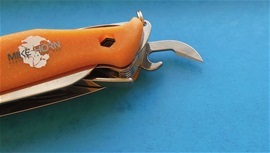 The pliers can be opened with one hand on the New Rangers, take advantage of the opening. The opening can vary some but it should be no problem on all. 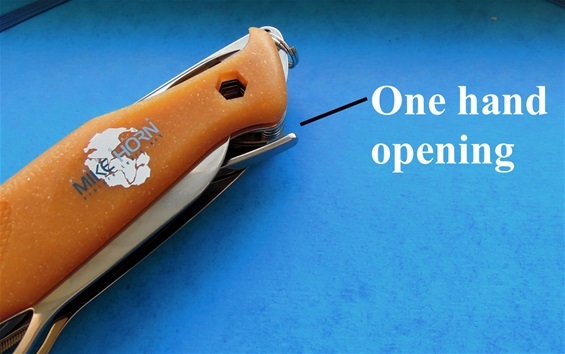 You use the opening towards an item or clothes to pull the plier handle out. The can opener is well known. Take the time to look around Sakhome.com and find talk and pages about combination tools. In a tactical sense for use on gear or other tasks then the ultimate philosophy is the combinations. By this I mean two separate tools. See the SwissTools page with under-pages! Here is the Evolution 17 Mike Horn Souvenir knife from 2011. It is a nice 85mm Wenger knife with some of the presence of the large 130mm. My knife is from 2011. With SAKs I have discussed the selection of tools on the Wenger 85mm and 91mm Victorinox knives. The combination of scissors and saw is one of the most popular combinations. This is because scissors and saw is very useful and helpful for people. For scouts, services or in the outdoors it is a valuable help. The other functions give it a versatile pack to have in the pocket. Then there is another combination that is very interesting and it goes into my research on the use of two individual knives in combo. It depends on the tactical and by tactical I only mean as tools for use on equipment, travel, outdoors or just in the house. The Wenger knives are no fighting knives but only good. There are many tactical combinations that you can make before-hand. 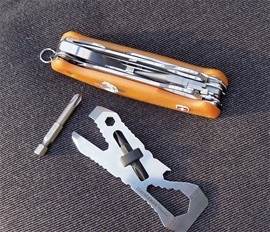 Different keys in combination with a plier and a MultiTool for example or two SAKs. The large 130mm Mike Horn and the souvenir knife go hand in hand because you get the small wood saw and scissors. It is close to a full pack together. If you please take the time on my page then you will find pages about the wood-saw and scissors that are much more versatile than many would expect. Sadly Wenger knives are no longer made and the knives I have shown are now more collectable. In the history of SAKs you will discover the Wenger handle materials. There are collectors that know more about this than me. I have found a few things also here. From 2004 and up this exploded and I am sure it is both the possibility of using new production methods and a new running change. It is not easy to find 100% information on the handle materials on the Mike Horn knives. However Wenger released a few interesting details about them. The handle material is innovative. It is partially made of recycled wood fibers. I did discover early on talk from different places about the use of plastic materials from the bottle industry as well. This I cannot confirm. The handle material is a composite. The handle material used on these two knives is for me mostly innovative because of the color and the environmental design. I do know that wood pulp has been used on Wenger knives a long time before in history. The Mike Horn knives and the handle material was made or designed to be recyclable. During the history and especially with Victorinox and Wenger the use of a more environmental design and production has been done. 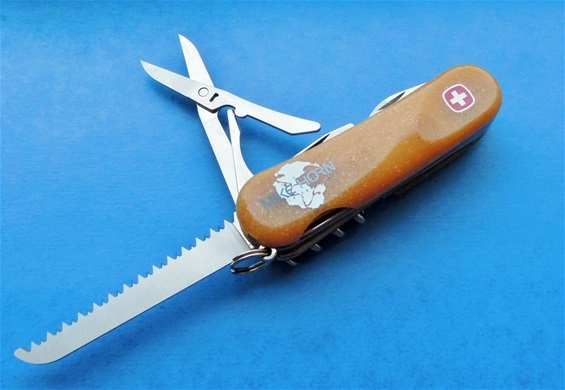 I know Victorinox best but it is clear with Wenger as well the respect for the outdoors and the nature. There is one more factor that is interesting and really worth calling innovative. A comfortable handle is a safe handle. The different handle materials used on SAKs are important for knives in general but also especially for Rescue. The texture on the Ranger especially is comfortable and safe. The feeling is special and nice. My favorite research and knowledge is the Wenger handle design. The texture and Evolution shape on the Mike Horn Ranger is one of the most special I have had in my hand. Please take the time to look around my page and see the Rescue Blades page with under-pages. See Milestones with under-pages on Evolution. There is much more information on Sakhome.com, take a tour! I am just a local man running around the small islands outside the island I live on. I have done much fishing and I have tested knives for myself to learn. Self learning is the ultimate teachings. I dared go out in my sit-on tip kayak early spring 2014 in the bad weather. I do not brag or call myself an expert but only a specialist. The weather this spring was abnormal. I have seen the climate change with my own eyes. I challenged the anxiety illness I live with. I am an independent person and I do not earn a dime by my hobby. I am rich with knowledge. 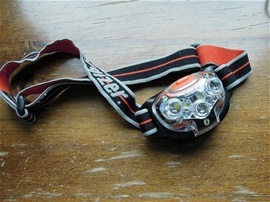 The Mike Horn Ranger is 250 grams and total with pouch and bits around 322 grams.